A worthy successor to Vancouver's Dude Chilling Park sign has emerged. Reddit user Unplug_The_Toaster uploaded the picture of the sign in Rudd Park in Saanich, B.C., and the Internet loved it. Then again, it's hard not to love anything involving polite Canadian vandalism and Paul Rudd. The American actor has primarily starred in comedies and is known for roles in "Ant-Man" and "Anchorman." 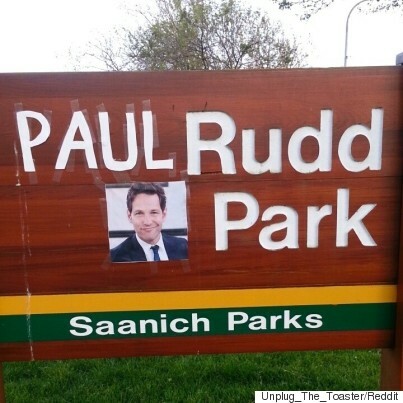 Now we just need a Paul Rudd Chilling Park sign for the ultimate vandalism triple threat. Follow The Huffington Post B.C. on Facebook, Twitter, and Instagram.